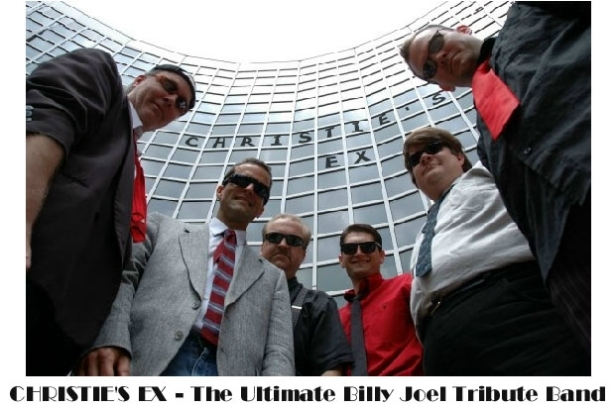 Check out the corporate/wedding band that features the members of Christie's Ex! "You don't make a claim like 'World's Greatest Billy Joel Tribute Band' without the balls to back it up. But over at East Nashville's French Quarter Cafe last Saturday night, CHRISTIE'S EX just might have pulled it off, even with Movin' Out playing across town at TPAC for about $40 more a ticket. Go ahead, laugh: we did as piano man MARK SCHAFFEL kicked off the goofy '80s-synth intro to 'Pressure', while bass player JD DOHNAL walked the room, chicken-bobbed his head, did splits off the drum riser, and generally acted like a guy trying to convince himself he wasn't in a Billy Joel tribute band. And yet the band's good humor and energy—and yes, O ye doubters, the generally astonishing songcraft of Joel's greatest hits—won over even the folks who sat with arms folded, pretending they didn't give a damn what happened to Brenda n' Eddie. Nashville, there may be a better Billy Joel tribute band somewhere, but we bet their bassist doesn't pogo through 'Allentown'." Don't forget to visit our myspace page. For problems with the site contact the webmistress.